For young students of preschool and elementary age, and for large, heavy multimedia projects. 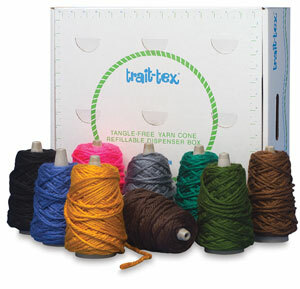 An excellent yarn for simple weaving, macramé, 3-dimensional projects, yarn painting. 4-ply 100% acrylic. 8 oz (28 g) cones, 85 yards (78 m). Dispenser box of 9 cones. Each 8 oz (28 g), 85 yards (78 m), total 765 yards (700 m). Gray, Blue-Violet, Yellow-Orange, Dark Brown, Dark Green, Black, Turquoise, Pink, Light Brown.